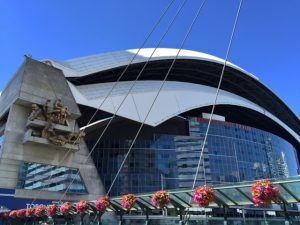 Toronto – June 26, 2017 – ASSA ABLOY Hospitality today announces the successful upgrade and implementation of its VingCard Classic RFID door locks at the Renaissance Toronto Downtown Hotel, a sophisticated hotel accommodation situated inside the Rogers Centre, home of the Toronto Blue Jays. By upgrading its previous ASSA ABLOY Hospitality-based room access platform to include VingCard Classic RFID door locks along with the Visionline locking solution, the property ensures against the latest security threats while offering state of the art convenience. 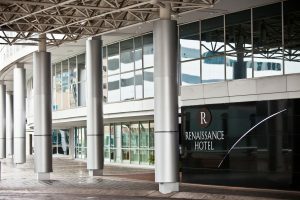 With the implementation of VingCard Classic RFID, the Renaissance Toronto Downtown Hotel gains a contactless solution that provides the latest in anti-cloning technology. Via the use of encrypted data, Classic RFID-based keycards are immune to unauthorized reproduction and can therefore provide a vital extra layer of security that is not available with magstripe technology. Classic RFID’s installation along with Visionline provides guests with unmatched peace of mind by allowing hotel staff to cancel lost or stolen keycards remotely. With Visionline, staff members can also oversee all access attempts across the property in real time, offering them the ability to instantly minimize the effects of a suspected security breach or even prevent one altogether. By using an online-based security access platform, guests can be re-assigned to a different guestroom or have their stay extended without ever having to visit the front desk. Properties equipped with Visionline can also provide guests with the ability to use the same keycard for different areas of the hotel, enhancing the guest experience, while reducing costs. With RFID technology, hoteliers also gain the opportunity to provide guests with an array of key format options, such as wristbands, keychain fobs or stickers in order to better cater to individualized needs. For more information about ASSA ABLOY Hospitality and its comprehensive line of locking solutions, or to schedule an interview with the team at booth #1101 at HITEC, please contact Dina Magdovitz at Dina@planapr.com. You can also learn more at www.assaabloyhospitality.com.